Did you print out this awesome printable nativity set last year from Jennifer & Jason? With both a color and black-and-white version, it’s the perfect advent activity — a little bit of craftiness and then — voila — a nativity set that kids can play with without any fear of the pieces getting lost or broken! When our oldest girls were all little, I printed and colored a set of “The Hungry Caterpillar” printables, cut them out, covered them in contact paper and added a magnet to each piece, and that set has seen hours and hours and hours of play from all four girls. I always meant to do more sets, but time and my own lack of follow-through prevented that from actually happening…until now. 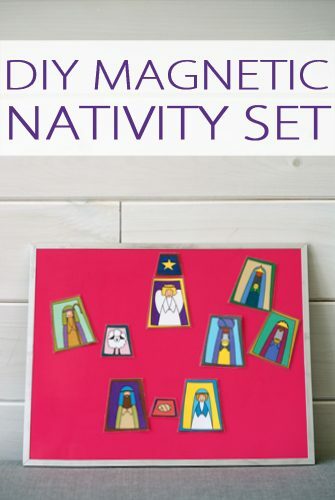 This year I printed out a fresh color copy of the printable nativity set and created this little magnetic set, and our four-year-old loves it! The contact paper makes the pieces durable, so hopefully it will be a set that our new little one enjoys in the years to come as well. If you haven’t already, start by printing a nativity set onto cardstock (color it if you’re using the black and white version! ), and then cut out all of the pieces. Carefully peel the back off the contact paper and lay the pieces out with 1/2″ between the pieces all the way around. If you’re very talented, you can probably do all of the pieces at once; otherwise you might want to cut out smaller pieces of contact paper and do just a few at a time so that you can get the contact paper smooth on both sides (ask me how I know!). Once your pieces are laid out, take a second piece of contact paper, peel off the backing and lay it on the back of the pieces you already did (sticky side together). Cut out each piece, leaving a 1/8-1/4″ edge of contact paper around the cardstock. Cut strips of magnet from your magnet tape and attach to the back of each piece.